To celebrate CARDI Day, the Bahamas office partnered with St. John’s College and corporate sponsor Generali to launch a school garden project at St John’s College. 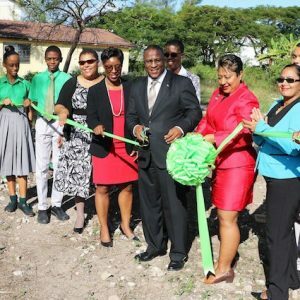 This project is part of the Institute’s programme in The Bahamas which seeks to positively influence children’s food choices, promote healthier habits and educate and engage students in Agricultural Science and environmental sustainability. Speaking at the launch of the project, Minister of Agriculture and Marine Resources the Honourable, Michael Pintard noted that the Bahamas imports more than 80% of its food while only 1% of its arable lands are under cultivation. He encouraged students to see the tremendous opportunities that exist within the sector, telling them that a career in agriculture is a dignified one which can positively change their lives while transforming the Bahamian economy. CARDI guided the establishment of several innovative practices for the school project including vertical and horizontal production systems. Crops such as broccoli, cabbage, lettuce and peppers have already been cultivated. CARDI Representative in the Bahamas, Michele Singh said that soon “we’ll be working with the school to introduce several climate smart agriculture practices and systems”. Like all countries in the Caribbean the Bahamas is vulnerable to the impacts of climate change and within the last few years the country has faced an onslaught of hurricanes and storms. Initiatives like these are critical to The Bahamas as the country is grappling with escalating chronic non communicable diseases, many of which are impacting youths. The Institute is hopeful that other corporate entities and schools can adopt and expand this farm/school movement in the Bahamas.